Athirapally Vazhachal the most famous scenic locations in Kerala - the God's own contry - visualize many enchanting experiences from the nature attracts domestic as well as international tourists and picnic groups especially for its two distinct water falls - Athirapally waterfalls and Vazhachal Waterfalls. How is the nature of Athirapally and Vazhachal Forest? Athirapally and Vazhachal forest area have different types of waterfalls, mountains, valleys, thick forests, greenery, various kinds of plantations, flora and fauna are some of the major attractions to the onlookers. Both Athirapilly water falls and Vazhachal water falls are the part of Chalakudy river in Thrissur district, Kerala. Athirapally and Vazhachal water falls are highly attractive and enchanted millions of people from around the globe particularly during the monsoon months (June-October). 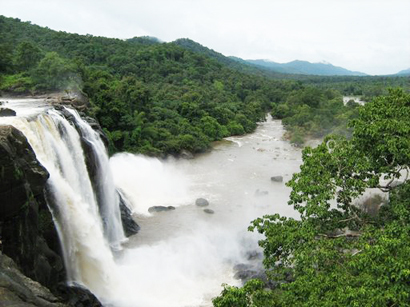 Recent survey reveals more than 7 million tourists visit both Athirapilly and Vazhachal water falls each year. The scenic beauty of Athirappilly water falls has always been attractive to film-makers from Bollywood and South India. Chalakudy river is the fifth largest river in Kerala which has never been dried yet, emerges from high ridges of western ghat, harnessed by Sholayar dam flows through the Vazhachal forests becoming slanting falls finally emerges as a magnificent, spectacular natural falls at Athirapilly. Majour Forest Types of Athirapilly and Vazhachal Forest Area are: West coast tropical evergreen forests, West coast semi evergreen forests and Southern moist mixed deciduous forests found at Athirapally and Vazhachal forest area. Emerging from the high ridges of Western Ghat, Chalakudy river is harnessed by a dam at Sholayar. The tail water is reused at Peringal and it finally emerges out of Vazhachal forests as a magnificent natural waterfalls at Athirapilly, with the lush green and enthralling sight of the evergreen forests as a backdrop. The height of the falls is 42 meter and the width is 220 meter. Being a place of great scenic beauty, a lot of movies have been shot here at Athirapilly waterfalls. A large number of tourists visit Athirapilly falls round the year. Chapra waterfalls is a small but magnificent waterfalls lies on the left side of the road, 3 Km, from Athirapilly waterfalls on the way to the Vazhachal waterfalls' Inspection Bungalow. During rainy season, Chapra waterfalls having a slanting height of 63 m and width of 28.3 m presents a beautiful sight. Vazhachal waterfalls and Vazhachal picnic spot are 5 Km from Athirapilly waterfalls with lush green forests and lofty trees on its left side, a stream having good fall of water and a small garden. Tourists frequenting to Vazhachal Picnic spot include students, nature lovers and foreigners who come here to enjoy the natural beauty of these forests. A refreshment stall run by the Vazhachal forest Staff Co-operative Society caters to the needs of the tourists. The Vazhachal waterfall is a scenic and popular waterfall on the edge of the Sholayar forest range in Kerala. The Vazhachal is part of the Chalakkudy River. Its cool, misty waters cascading down with the backdrop of thick green forest and rocky terrain are a scintillating experience for visitors. Very rare and famous medicinal flora found in Vazhachal Forest area. Some of them are Artocarpus Hirsutus, Antiaris toxicaria, Calophyllum polyanthum, Canarium strictum, Dipterocarpus indicus, Grewia tillifolia, Hopea parviflora, Lagerstroemia lanceolata, Mesua ferrea, Syzygium cumini, Terminalia paniculata, Terminalia crenulata, Terminalia bellirica, Vateria indica, Xylia xylocarpa, Canes, Reeds and Bamboos etc. Vazhachal Forest area maintains its abundant animal assets. Some of them are: Asiatic Elephant, Tiger, Leopard, Bison, Sambar, Porcupine, Lion tailed Macaque, Malabar Squirrel, Viper, King Cobra, etc. Lucky tourists can enjoy the wildlife sightings while moving from Athirapilly to Pokkalapara through the main road in the late evenings. There are eight Tribal colonies in Vazhachal Forest Division. The main tribes are Kadas and Malayas. In a noble attempt to save medicinal plants from extinction an area of 111.68 hectare has been well protected from in-site conservation, financially and technically assisted by the Foundation for Revitalization of Local Health Traditions (FRLHT), an NGO with Headquarters at Bangalore. Vazhachal Forest Division is one of the eight sites set-up in Kerala by the foundation for creating awareness among public on conservation and protection of medicinal plants in our forests. Rare, Threatened and Endangered species have been given special protection and propagation measures taken up. A Demonstration Plot displaying the important medicinal plants along with their uses has also been established near to Vazhachal Inspection Bungalow. These mighty hill ranges influenced the culture, language, social life, economy and life styles of the people on the western coastal region. Rising from Tapti river in Gujarat, these run to Agasthyamala at the southern tip with a gap at Palakkad. The continuity of these mountain ranges and forests were broken in the past by perhaps, the selection felling in the natural forests resulting in severe damage to undergrowth, clearance of dense natural forests for raising extensive commercial plantations of teak and pulp wood and the encroachments. Mining also took its toll. Animal corridors were broken, and man-animal conflict increased. Very small pockets of compact natural forests are remaining now. Vazhachal forests are one of them having an extent of 413 Sq. Km. Abundance of Flora and fauna in the Vazhachal forest area is the result of natural protection rendered by Parambikulam Wildlife Sanctuary, Chalakudy Forests and Malayattor Forests. Location of Athirapally and Vazhachal Water Falls: North Latitude - 10 deg 5.5' and 10 deg 23' and East Longitude - 76 deg 9' and 76 deg 52.5'. Altitude of Athirapally and Vazhachal Water Falls: 200 - 1300 m above sea level. Area of Athirapally and Vazhachal Water Falls: 413.93 Km2. Annual rainfall at Athirapally and Vazhachal Water Falls: 3441 mm. Temperature of Athirapally and Vazhachal Water Falls: varies from 20 deg to 30 deg. Climate of Athirapally and Vazhachal Water Falls: pleasant throughout the year. Vazhachal Forest Division falls within Mukundapuram Taluk of Thrissur Revenue District and Aluva Taluk of Ernakulam Revenue District with five territorial ranges namely Athirapally, Charpa, Vazhachal, Kollathirumedu and Sholayar. There are eight Forest Stations. 1. Forest Range Officer: Charpa Range, Post Peringalkuthu, Thrissur Dt., Kerala - 680721. 2. Divisional Forest Officer: Vazhachal Forest Division, Post Chalakudy, Thrissur Dt., Kerala - 6806307. 3. Conservator of Forests: Central Circle, Vanapriya Complex, Paravattani, Thrissur Dt., Kerala - 680005. Kerala Tourism Information Office: Park View, Thiruvananthapuram, Kerala. How To Reach Athirapally and Vazhachal Waterfalls? Athirapally and Vazhachal waterfalls are easily accessible from NH-47 at Chalakudy. No matter you come from either Thrissur or Ernakulam, point yoour dirction to Chalakudy town. Then eastward diversion from Anamalai junction which is very close to Chalakudy north junction. Now you are on the Athirapally Valparai road. While traveling towards Athirapally, you can enjoy with many other picnic spots. Another route can be opted if you come from Pollachi via Valparai, Tamilnadu. The road moves through the thick sholla forests of Western Ghats. This route is little bit risky for there may have blockage of wild Elephants. Travel to Athirapally and Vazhachal water falls By Air: Nearest airport to Athirapally and Vazhachal is the Kochi International Airport, Nedumbassery, about 48 km. Travel to Athirappally and Vazhachal By Rail:Nearest railway station to Athirappilly and Vazhachal is at Chalakudy, about 33 km. Another major Railway station is in Thrissur, about 61 km. Travel to Athirapally and Vazhachal By Road: A fairly nice road takes you to Athirappilly and Vazhachal from Chalakudy town or private bus station, about 28 km. Tourists can hire taxis from Chalakudy town or travel by regular public / private transport buses plying between Malakapara, Athirapilly and Chalakudy. Through out the year, but best from June to October. Always pleasant, humid weather shall be observed in Athirappilly and Vazhachal; Water flow drastically increasing during the monsoons - June to October. Athirappilly and Vazhachal tourist spots, being in one of the most important Ecotourism Zones in Central Kerala, are frequently visited by thousands of tourists throughout the year. The heavy biotic pressure on the forests severely affects the environmental hygiene and results in a lot of soil erosion, accumulation of garbage, occasional instances of fires and spoiling of natural beauty. Due to paucity of funds, it has not been possible for the Kerala Forest Department (KFD) to engage enough labourers for disposing off the garbage, maintaining the environmental hygiene and security of the tourists. With the main objectives of conserving and protecting the existing forests from various types of biotic interferences, maintaining the environmental hygiene, creating awareness among the people about the need to conserve forests, involve tribals in the management of forests and enhance their standard of living, it has been decided to manage this area through Participatory Forest Management by constituting a Vana Samarakshana Samithi (VSS Vazhachal) of tribals residing in the Vazhachal Tribal Colony. An area of 788 hectares has been covered under this VSS. Registered as Tribal VSS number 331-112001 with the Conservator of Forests, Central Circle, Thrissur. The VSS generate financial resources through levy of Service Charges from visitors. The resources so generated will be utilized for protecting the forests from and various types of biotic interferences, developing of minimum basic infrastructure facilities for the tourists, maintaining environmental hygiene for full enjoyment of tourists which would include drinking water, garbage disposal, toilets, maintenance of the existing trek paths, engaging the trained tribal men for safety of the tourists, creating awareness among public through classes, distribution of pamphlets, etc. and arranging adventure trekking on the prescribed routes with the help of trained tribal guides. Please help Authorities and Volunteers in protecting forests. Please help to keep the Athirapally and Vazhachal Waterfalls area clean. Please spread the message of conservation Athirapally and Vazhachal Waterfalls to public. Don't Feed wild animals at Athirapally and Vazhachal Waterfalls. Don't use plastic bags in the Athirapally and Vazhachal forest area. Don't throw garbage in the forests of Athirapally and Vazhachal. Don't venture deep into the forests of Athirappilly and Vazhachal. Don't light open fire at Athirapally and Vazhachal. Don't carry arms and weapons Athirapally and Vazhachal. Don't use unspecified paths Athirapally and Vazhachal. Don't damage, hurt, remove any plants or animals Athirapally and Vazhachal. Don't swim in the river within the forest of Athirapally and Vazhachal. Please avoid night movement between sunset and sunrise at Athirapally and Vazhachal. Please avoid blowing horn, using loudspeakers, transistors, making noise at Athirapally and Vazhachal. Please avoid going on excursion in a state of intoxication at Athirapally and Vazhachal. Charpa Falls: To the east of athirappilly is the enchanting but lesser known Charpa falls which plunges on to the road during monsoon. It is a sight to watch and enjoy. Anakkayam: About 20 km from Chalakudy on the sholayar peringalkuthu route, Anakkayam means the "Elephant pit". It is noted for a lake with cool and placid waters. The place is a forest untouched by human encroachments and is a haven for those who wish to escape from concrete jungles. It attracts the visitor with its bubbling streams, natural rock formations and flora. Water Theme Parks: For those who want a little extra recreation there are two water theme parks nearby with plenty of adventure games and water sports. 1. Dream World Water Park, Athirapilly Road, Chalakudy, Thrissur, Kerala. 2. Silver Storm Amusement Parks, Athirapilly, Vettilapara P.O, Chalakudy, Thrissur Dt, Kerala. Malakapara Tea Gardens: For the adventurous a family safari through the deep forest and high ranges (Western Ghats) complemented with lots of hairpin curves takes you to the fascinating sculptured beauty of Malakapara tea Gardens. Along the route if you are lucky you may end up seeing some good wildlife. Thumboormuzhi Gardens: Thumboormuzhi is an ideal stopover with its garden, scenic splendor and a classic waterfall. Thumboormuzhi is located in Pariyaram Grama Panchayat 15 km to the east of Chalakkudy town. Peringalkuthu & Sholayar Dams: Deep in the forest on the way to Valpara are the two dams that generate hydroelectric power to the state. Entry to the dam site is with special permission only. Vazhachal Forest Gardens: With the abundant flora and even herbal plantation maintained by the forest department, Vazhachal is a Botanist's treasure trove. Information about Tourism Ticket fee for visiting Athirapally and Vazhachaal waterfalls are found here. Charpa waterfalls and Vazhachal waterfalls making me excited to travel more. Will go to book tours and enjoy some exciting points around me. Quite excited for that.